In 1954 real-estate investor R.H. Conner, in conjunction with the builders George Bell and Ted Valdez, acquired land, which sprawled over 1200 acres of wetlands, fertile slopes and timbered hills for a planned community. 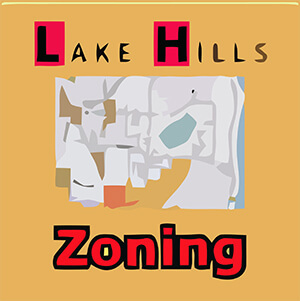 They bought the land from Modern Homebuilders and got rezoning approval for city lots centering on winding Lake Hills Boulevard. 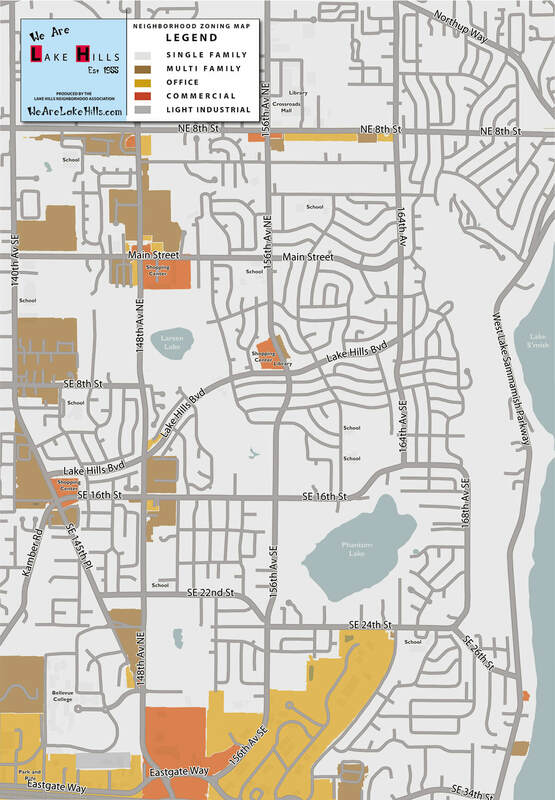 Envisioning a livable future neighborhood, the men prepared to create an instant community with streets, infrastructure, shopping and public areas, and 4000 homes (Hinshaw). 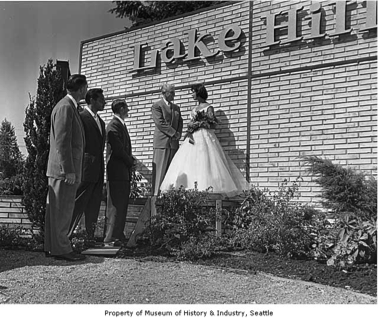 In 1955, Lake Hills was proposed as the largest planned community in the Pacific Northwest. 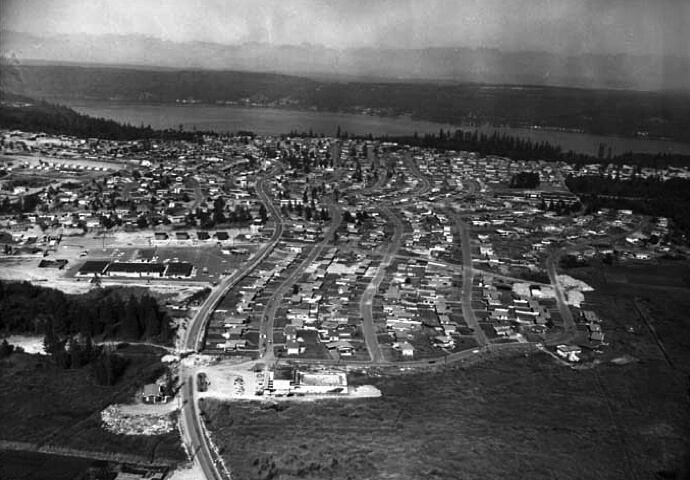 As Seattle Times described it, a “self-contained city in a country atmosphere” (Boswell), integrating education, recreation, shopping, and worship with a carefully designed community of single-family homes. Homes in Lake Hills were about 1000 square feet and faced one another across streets with no curbs, lights, or sidewalks. The development project was inexpensively built on inexpensive land, and met an acute postwar need for middle income housing. 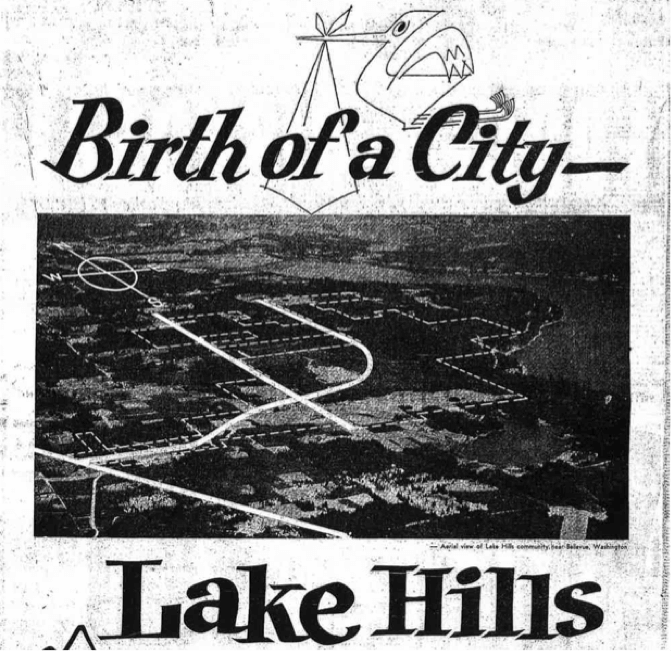 After years of near independence, in 1969 the people of Lake Hills determined that their interests would be best served by joining Bellevue and voted for annexation. 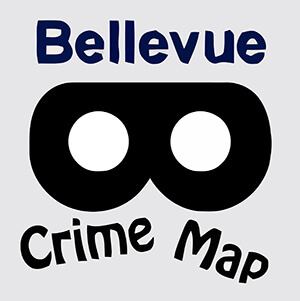 Today, the East Bellevue Community Council (EBCC), an elected five-member body, has the legal authority to veto land use and zoning decisions by the Bellevue City Council. Having its voice represented by the EBCC, Lake Hills is essentially a town within a town. 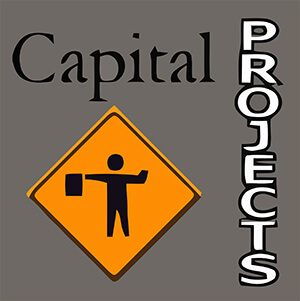 Over the years the neighborhood has experienced population growth and infrastructure development. Today, the Lake Hills community is known as one of the most diverse in the Pacific Northwest and has upwards of 20,000 residents; mostly representing the middle-income class. 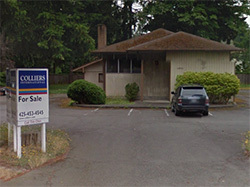 The area contains much of Bellevue’s relatively affordable single-family housing. 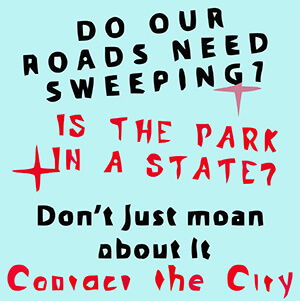 The richness of the neighborhood lies in its social infrastructure, extensive system of open space and recreation facilities, and natural topography (bellevuewa.gov). John Andersen- An architect and structural engineer for Bell & Valdez. 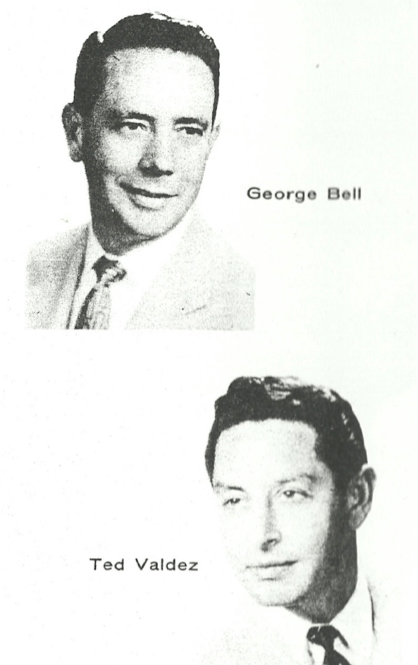 He was a Northwest pioneer of pre-fabricated subassemblies for flooring and framing. He maximized the economy of multiple productions by engineering his design so that much of the on-site work was assembly of framing elements rather than construction from scratch. Andersen placed a great deal of emphasis on planning so that a limited number of models gave the greatest effect of variety. The architect was proud of the heavy California influence in his designs, mentioning that he frequently visited there to see other trends. Kinney Leonard- Builder and founder of Leonard Homes, Inc and also built numerous homes in the Lake Hills development. He was a second-generation builder who had planned many PNW construction projects and custom-built many leading Seattle residencies in exclusive Gregory Heights, Normandy Park and Seahurst. Harstad and Associates – Designed a complete storm and sanitary sewage system in Lake Hills with a private treatment plant. The Larsen Lake Farm (also known as Blueberry Lake) was named for a Danish couple, Ove and Mary Larsen, who homesteaded in the area in 1890. 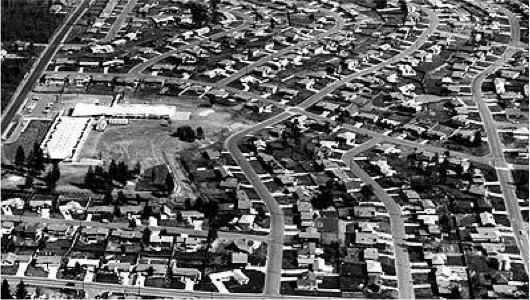 Their house stood where a K-Mart was built in later years (and where the Walmart sits today). The Larsens harvested wild blue huckleberries and cranberries from the surrounding wetlands. In 1918, the Larsens sold half the property to the four Aries brothers, who turned the property into one of the largest vegetable farms in the area. The other half of the property was sold to Louis Weinzirl in the 1940s, who started the blueberry farm. A one-room Phantom Lake Schoolhouse was built in 1894. Read an article from the Bellevue Reporter as Phantom Lake School celebrates it’s 120th anniversary. This first school building was a log cabin where the students had to do their written work on rough wood planks nailed to the wall. The students had to carry their chairs to school with them and the school term was only four months a year. 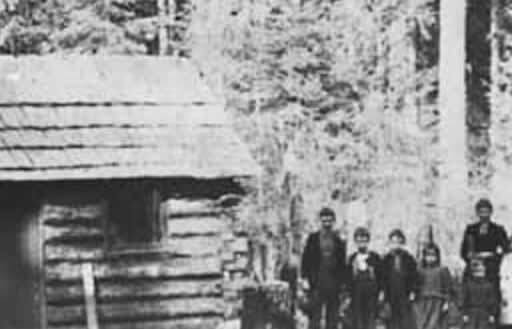 The log cabin was located near where Eastgate fire station is now. In the early 1900s, students would sometimes see Native Americans who lived near Lake Sammamish picking blackberries around Phantom Lake. There was a hitching post for the kids who rode their horses to school. In addition to math, geography and reading, students also learnt how to repair farm tools and build outhouses. A second school building, built in 1917 was sold in 1942 and turned into a residence. 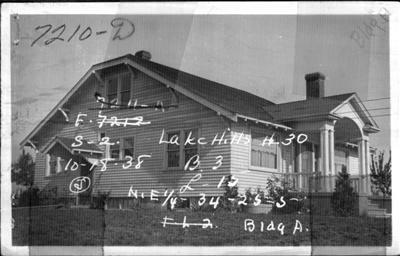 The building still stands today at 14821 SE 16th St. There was no Phantom Lake School for 16 years. In the early 1990s, Phantom Lake Elementary was among the first schools to go to a 4 1/2 day week, and piloted community partnership programs. In 2003, it was the first of Bellevue school district’s elementary school rebuilds, boasting many technological advancements for it’s time. Too often, the ghostly mist after which Phantom Lake takes its name has actually been smoke from a number of school fires. The first fire in the 1890s was put out by a student whilst the teacher was taking a cigarette break! A second fire in 1963 was in the multi purpose room, and the smoke could be seen from miles away. A third occurred in 2002, the year before the current building was erected in 2003. The Robinswood House Estate is comprised of the Main House and the surrounding grounds, the Cabana, the original 1884 log cabin, and a small barn. The Main House was built in 1895 by Hans Miller to accommodate his growing family, and has been successfully renovated to retain its original charm. It features the original log framing, solid oak floors, and a vintage stone fireplace which has been converted to gas. It is one of the oldest pioneer homesteads in the Puget Sound area in it’s original location. 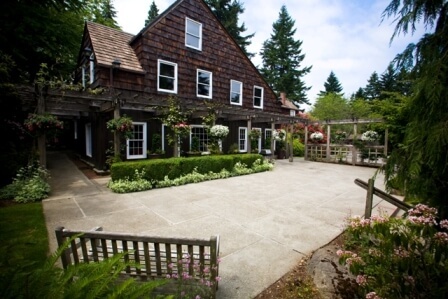 In addition to its own beautifully maintained formal English gardens and outdoor patios, Robinswood House offers sweeping views of Robinswood Park, a 60-acre oasis in the heart of the Eastside. In 1958, 250 dedicated families in the Lake Hills neighborhood of Bellevue broke ground on the Olympic Athletic Club, originally envisioned as a “club house and outdoor pool.” The following year, they renamed it the Samena Swim & Recreation Club. Within five years, Samena completed construction of its first indoor aquatics facility. Samena has grown from a one pool facility to a full service swim, fitness, education, and recreation club. Today, the club offers 3 pools, a fitness facility, before and after school care programs, preschools, and a great place for families to participate in wellness programs. Originally the site of Lake Hill’s private waste water facility and treatment plant, St. Louise Parish School opened in September, 1961, with a student enrollment of 425 in grades one through six. Enrollment increased by 125 students in the following two years and expansion of facilities became essential. An additional seven-classroom wing was completed for the fall of 1963. Grade seven was added in 1962 and became the first graduating class in 1964. By 1966 there were three classrooms each for grades one through five; two for sixth and seventh; and one for eighth. Built in 1935, this is one of the earlier Lake Hills houses, hidden away on a 1950s street. Second Phantom Lake Schoolhouse, built in 1917 (see Phantom Lake info above). 1944: The Servicemen’s Readjustment Act (G.I. Bill) was issued to prove a resource of benefits for WWII veterans. Benefits included guaranteed low-interest mortgage loans which allowed for home purchases for millions of middle class citizens.